Code Dojo | Game development, technology, and Japan. Sure, there are ways to get exercise while gaming. Virtual reality and music games like Dance Dance Revolution come to mind. But that’s all worthless when your kid just wants to play Fortnite. I first built a cheap version (~$120 in parts). It just blanks the screen when you’re out of energy, and uses an LCD screen to show energy left. I then did a better but more expensive way (~$700 in parts) but it’s a lot cooler. 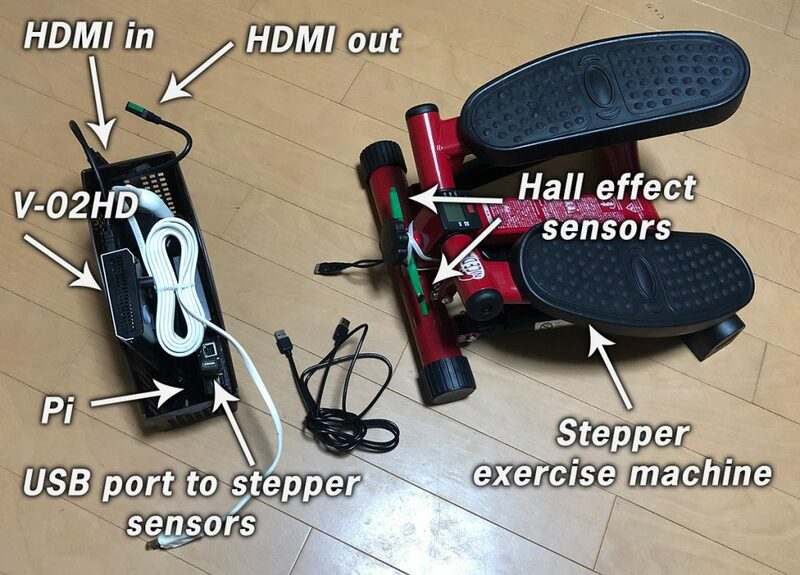 The sensors are placed on a stepper exerciser. 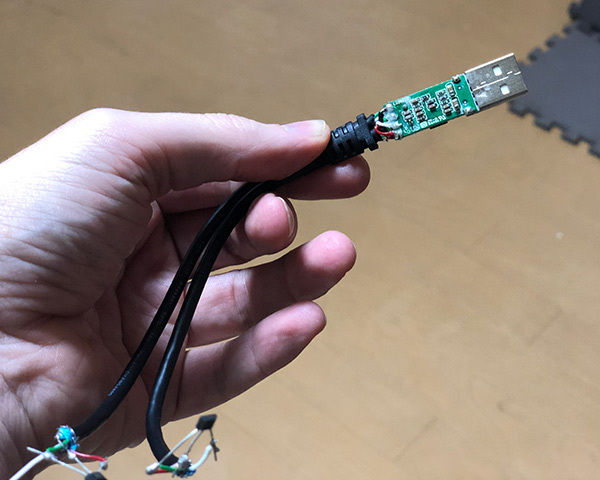 I used a USB connector for the wiring so I could unplug/replace it later if I wanted to setup a different exercise machine, like if I ever got a stationary bike. 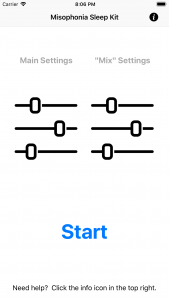 Each hall effect sensor requires three wires. We have two sensors. So we need to run six wires from the Pi GPIO pins? WRONG! We only need four because the power and ground can be shared between them. So I partially wired it up but when testing found that the middle pins had no continuity. Can you guess why? WHAT THE HELL IS THIS INSIDE THE CABLE?! It’s got a hub or something hidden in the connector. I never plugged it into an actual PC or I might have noticed. No wonder it didn’t work. I removed the electronics part (it was a horror, I shouldn’t be allowed near soldering irons) and it worked as expected. Moral of the story is, I’m dumb, and don’t trust USB splitters to just split the wires. My “cheap” way ignores rendering anything graphical (It doesn’t output any HDMI itself) and just shows a single “energy count” number on an LCD screen. When it gets low, the game’s HDMI signal will be completely shut off until it goes positive again. In the video above I’m using little buttons to test with instead of the stepper. To help the user notice the screen is about to shut off it makes a beeping noise as the counter nears zero. I suggest never testing this at an airport, can’t stress that enough really. So how can a Raspberry Pi turn on/off the game’s HDMI signal? I only use one of the outputs on the splitter as I don’t really need any splitting done. It’s possible to kill the power on a specific Pi USB port using a utility called uhubctrl. And because the HDMI splitter is now unpowered, the signal dies killing the game screen. After turning the USB port back on (replacing “off” with “on”) it will power up and start processing the HDMI signal again. Originally I was using the Pi to turn on/off an entire AC outlet but that seemed like overkill – I was thinking maybe turning off an entire TV or something, but meh. 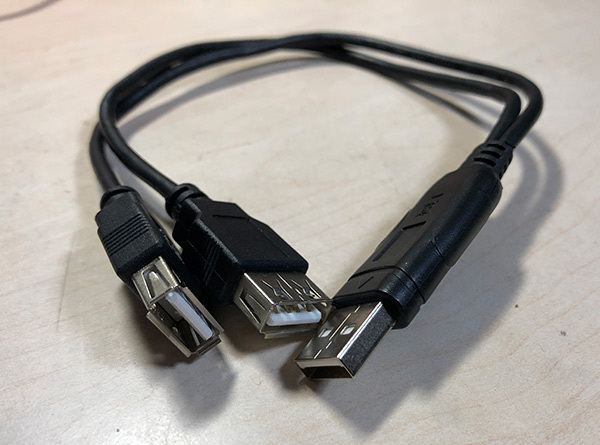 Alternate way to disable the HDMI signal : Instead of this no-wiring hack, maybe instead run it through an HDMI cable but put one of the pins into a relay to turn that pin on/off? Might be the same effect but cheaper and simpler.. although, which pin?! There isn’t enough drama in simply turning the HDMI signal on/off – wouldn’t it be better if holes started spawning randomly over your actual gameplay and you had to pedal to remove them as your screen became increasingly obscured?! There are a million options, really. The Raspberry Pi can generate the graphics (thanks GLES) and audio but we need a way to overlay its HDMI output over the game’s HDMI signal with no noticeable latency costs at 60fp. 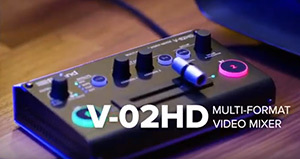 The V-02HD. A lot cheaper than $5,000. Does anybody know a better/cheaper alternative? If I could figure out a no latency way to overlay with an alpha channel instead of just chroma that would really be ideal. Although I didn’t need or use it, it’s worth noting that it can show up as a USB MIDI device and be controlled via MIDI signals. 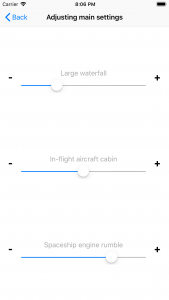 I did not need those features but that’s pretty cool, assuming the Pi could work with it, you could do transitions between inputs or enable/disable effects. The software to control things uses Proton SDK with its SDL2 backend and WiringPi for the GPIO to read from the sensors. It’s modified from the RTBareBones example. Here’s some info on how to compile Proton examples. Might be fun to simply design Pi powered pedal games that use the stepper as a controller. You could then output straight to a TV or TFT screen without worrying about the spendy chroma-keying solution. I mean, sure, my kid would refuse to play it, but it could be a funny thing to show at a meet-up or something. Cycflix: Exercise Powered Entertainment – Uses a laptop to pause netflix if you don’t pedal fast enough. 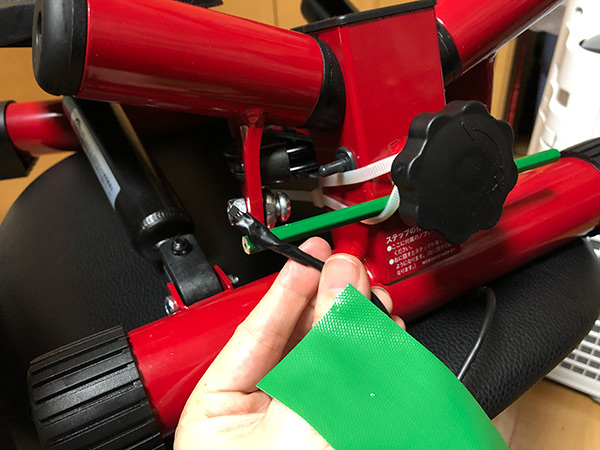 He connected an arduino directly to the existing stationary bike electronics to measure pedaling, smart. No TV unless you exercise! – Arduino mounted on a stationary bike cuts RCA signal via a relay if you don’t pedal enough. Uses a black/white detector for movement rather than hall effect sensors. TV Pedaler – A commercial product that blanks screen if you don’t pedal enough that is still being sold? The website and product seem really old (no HDMI support) but they accept Paypal and the creator posted here a few years ago about his 1999 patent and warned about “copying”. Hrmph. His patent covers a bunch of random ideas that his machine doesn’t use at all. Patents like this are dumb, good thing it says “Application status is Expired – Fee Related” I guess. The EnterTRAINER – This defunct commercial device is basically a TV remote control with a heart monitor you strap to your chest. Controls volume and TV power if your heart rate goes too low. Its hilarious infomercial was posted in one of the reviews. The 123GoTV KidExerciser – Ancient commercial product that lets you use your own bike in the house to blank the TV if not pedalled fast enough. Company seems gone now. 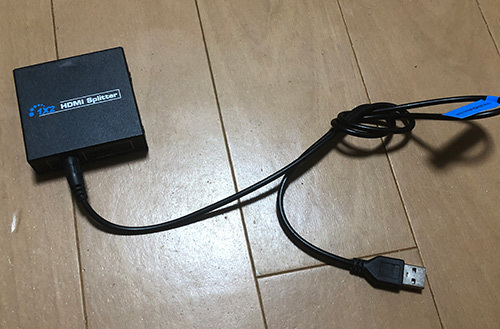 This entry was posted in Development/RTsoft, Proton SDK, Raspberry Pi, Tech Tips on February 10, 2019 by Seth. This entry was posted in Development/RTsoft, gamejam on December 4, 2018 by Seth. “I can hear you breathing… sorry kid, but you’ve got to stop or leave the room” is something Cosmo has heard many a time while using the computer next to me. As my long suffering family can attest, I’ve had a “thing with sound” for a long time. It’s one of the reasons I love my job – I’ve worked alone in a room for most of the last thirty years. 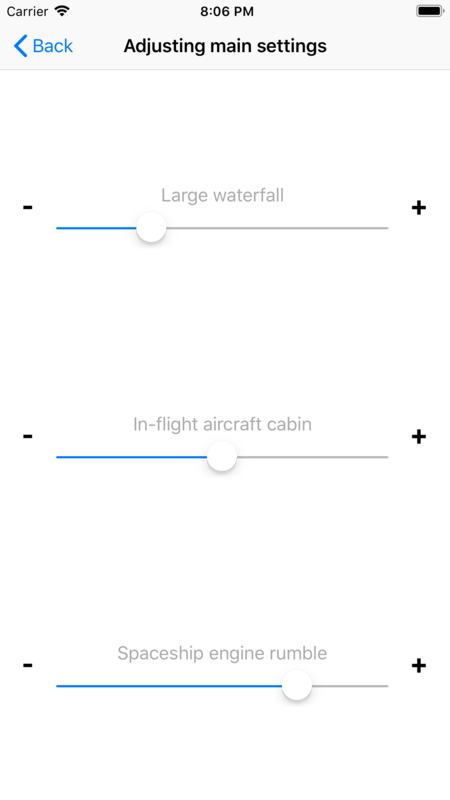 Introducing… my white noise app! 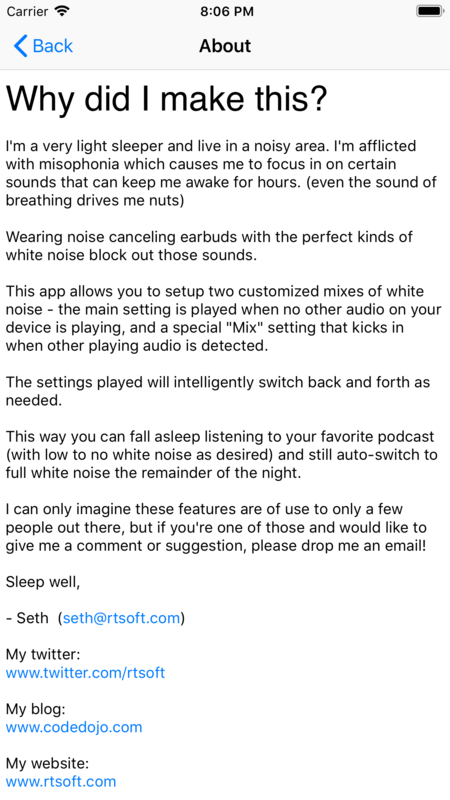 I wrote it because I couldn’t find another app that would automatically “mix” a small amount of noise to the podcast I like but have it switch to a different setting when it detects no other audio is playing so I can sleep through the night. It’s easy to use, has the perfect custom mixable sounds, and is totally free. 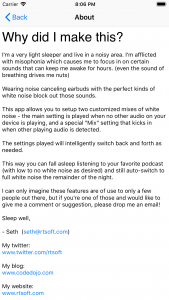 If you use white noise at all, check it out. This entry was posted in Development/RTsoft, Life on November 28, 2018 by Seth. 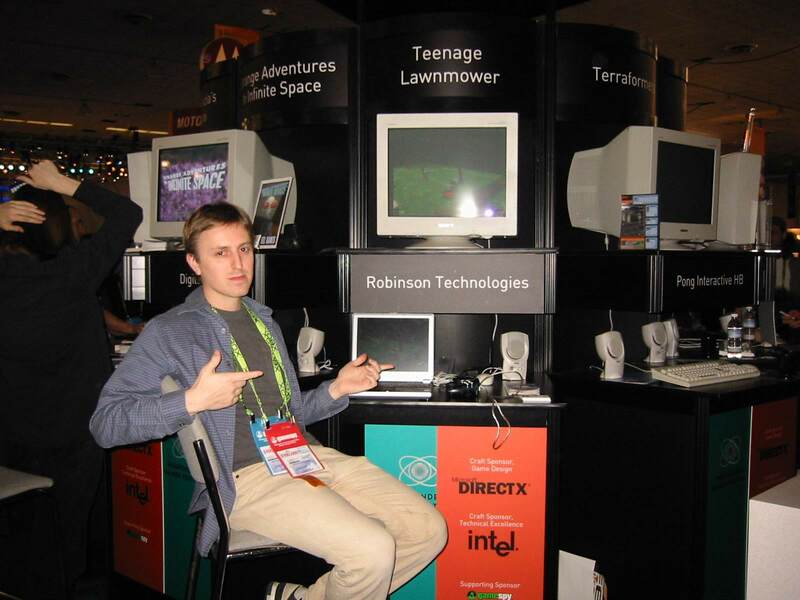 Originally $19.95, our old game Teenage Lawnmower (originally released in 2002) is now a free download. It requires Windows XP or newer to play. Tested fine on Windows 10. Payment for mowing jobs is now slightly randomized, it was an easy change, just had to edit some .c scripts, makes the game slightly easier as well. The text version of the .c script files are now included uncompressed/encrypted. 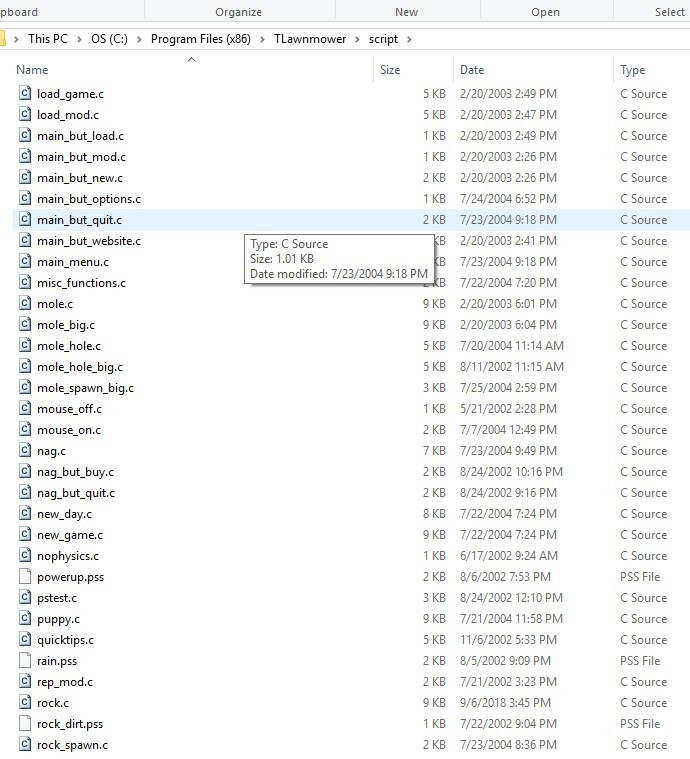 You can edit a .c file in any text editor and the game will instantly be changed – its scripting system doesn’t require compiling or anything. For posterity the source code/etc is now on github. Anybody is free to steal its 3D engine, its C style scripting engine, or try to port the game to something else. Warning & disclaimer: It’s 15 years old, I don’t recommend learning from or re-using this code. I mean, it’s better than Dink Smallwood’s code, but I wouldn’t call it elegant or anything. Now, while I’m here, I thought it would be fun to talk about the experience Akiko and I had of developing it, how many copies it sold, stuff like that. For reference, I’ve kept the original TLM website frozen in time here. My dream was to write a 3D RPG. In those days, that meant writing your own 3D engine – there was nothing off the shelf you could start with like there is today that would have the power I’d need. Having been through the gauntlet of completing something as massive as a role playing game previously (Dink Smallwood) and barely surviving, I knew that the key would be to develop the engine using smaller sub-goals. TLM was the stepping stone to something greater. Spoiler alert, looking back, it was the only game I sold that was completed using my 3D engine, the RPG never happened. So without this “stepping stone” I probably would have nothing at all to show for all that work on the engine. Working for years on engines and ending up finishing nothing is very common in my circles, big games are <font size=1,000,000,000>REALLY</font> hard to finish. It took around four months from start to finish. I’d already been working on the 3D engine for a while before we started TLM though, if I included that, it would be much longer. I went overboard with the DRM. I think I was overlay concerned about this because previously Legend Of The Red Dragon was pirated at a huge scale and our RPG Dink Smallwood had hit the warez sites the same day as its release. It hurts to know someone who pre-ordered the game probably only did so to pirate and share it. TLM was never pirated as far as I know. I later used this same anti-piracy system for Toolfish and Dungeon Scroll. After a few years, I removed the DRM from all of my software. Did I ever really need it? I still have all the sales data so here it is. We started selling it using a payment processor called RegNow. The first sale happened on August 28th, 2002. So that breaks down to $1600 a month (ignoring support and just looking at the four months of development) for two people. We were energized by being chosen as a finalist, despite the $2000+ cost for the two of us to attend the conference from Japan. I mean really, that ate up a third of our earnings from the game! I didn’t learn though, I went back in 2003 when Dungeon Scroll was a finalist as well. We joked that we just couldn’t afford to enter the damn IGF anymore. My cheapo laptop could only run the game at 20 FPS or so. Hosting a booth takes a lot of energy, the ability to talk up your game, and an outgoing personality. Yeah, I’m zero for three. I’ll be happy to never run a booth again! Was it worth spending that much to go even though we didn’t win jack? I don’t know, it was a good experience or whatever. 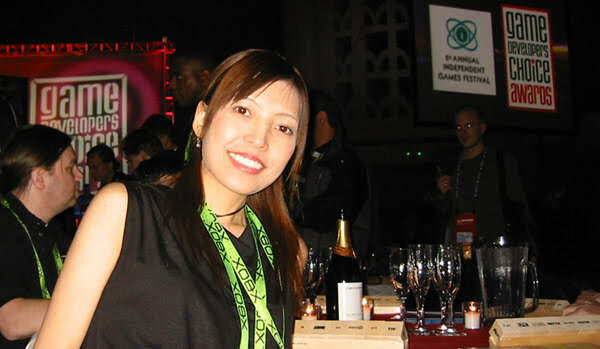 It was my first time to the Game Developers Conference. Being a finalist didn’t seem to generate many sales or website hits, not enough to notice anyway. It did score me a few interviews; I found this one with Gamedev.net. Hard to see in this pic, but those are beagles down there! 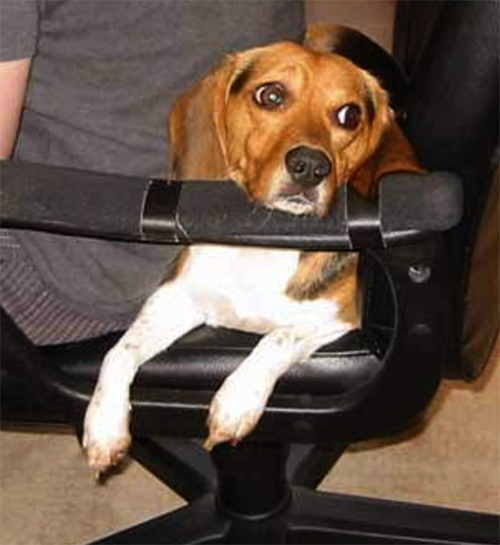 The beagle was modeled and textured from our real-life Beagle, dekochan. It’s really his bark sound effects in there too. Dekochan’s 3D model also made an appearance in our iOS game Tanked. So what about this incredible RPG engine that was sure to be an investment in RTsoft’s future? Well, before TLM we did use it in another “stepping stone project”: a game called Tarzan: Guardian Of Earth for a gamedev.net contest. 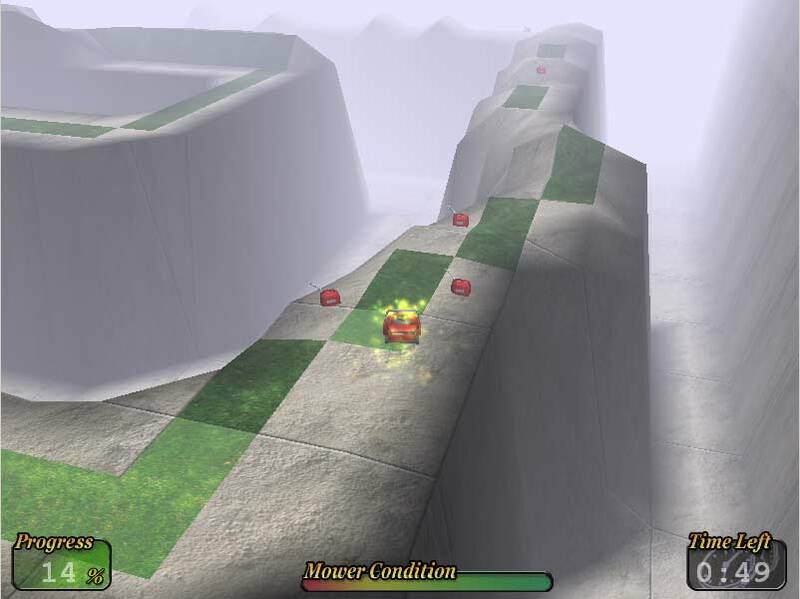 Lightning that can set trees on fire and some other effects were re-used in TLM. Tarzan won first place in the contest, which is why I politely shame the gamedev guys to cough up the prize for it in the interview I linked earlier. I was kind of bummed with the delay because I really could have used that graphics card. Fifteen years later, is Teenage Lawnmower any good? The mowing itself isn’t quite as fun or interesting as it needed to be to not feel a bit grindy and boring after a while. The mowing mechanic is kind of like Splatoon, you need to cover the ground (mowing is a little like painting) and there is a bomb thing that can mow a large area. There are 17 “lawns” (think levels) which customers will ask you to mow. You can say no to lawns you don’t like, and other customers will ask, but you’ll lose precious time in the day. The idea is that every lawn has a unique theme that is tied to story surrounding the customer. Sometimes that story is even tied to the main story, like when your mom dates one of your freakier customers who live in the woods with dogs. In the movie at the top of this article, you see a bunch of lemonade pitchers on the lawn. The owner is an older woman trying to seduce you, she’s drugged the lemonade. If you touch one with your mower, your controls get reversed, making it much harder. If you touch three, well, you pass out and unspeakable things happen. The second part of the video is mowing a guy’s lawn who has a mole problem. If you kill a mole, that’s bad, but if you hit an empty hole, it gets removed and generates bonus dollars. A cemetery has skeletons reaching up through the dirt, a rich guy has money randomly spawning around his mansion, a golf course has ducks (yup, the one from Dink Smallwood) and a lady with only a tiny grass patch in the city presents a moral quandary concerning stealing from her wallet. The metagame to tie together the arcade sequences is earning money to meet various demands at home, which is the “story” portion. The scripting system made it easy to quickly write and test dialog. The story deals with topics like alcoholism and domestic abuse. I was trying to get the player to care about what happens and push through to the next story dialog. Choices you make can matter, for instance, your stepdad Todd will treat you differently depending on if you took his steak from the fridge or not the day before. On day thirty you’re treated to one of three story endings based on which difficulty level you’re playing. I’ve un-protected the scripting files for this public release, so if you navigate to the script or scriptg directory, you can see how a game like this is setup and uses 99% scripts that can be edited on the fly. Look at a few and make changes, you could make your own story or cheat! The directory script/event holds the story for each morning/night, and script/levels holds the level logic for each lawn. .pss files are particle systems I think, .wet is weather, I think .zon is the level and its terrain, and .obj describes the objects in the level. Maybe. The .X files are the models. Remember .x files?! 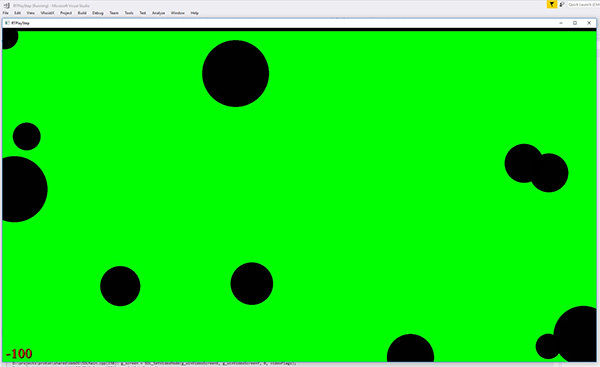 .dds files are textures. 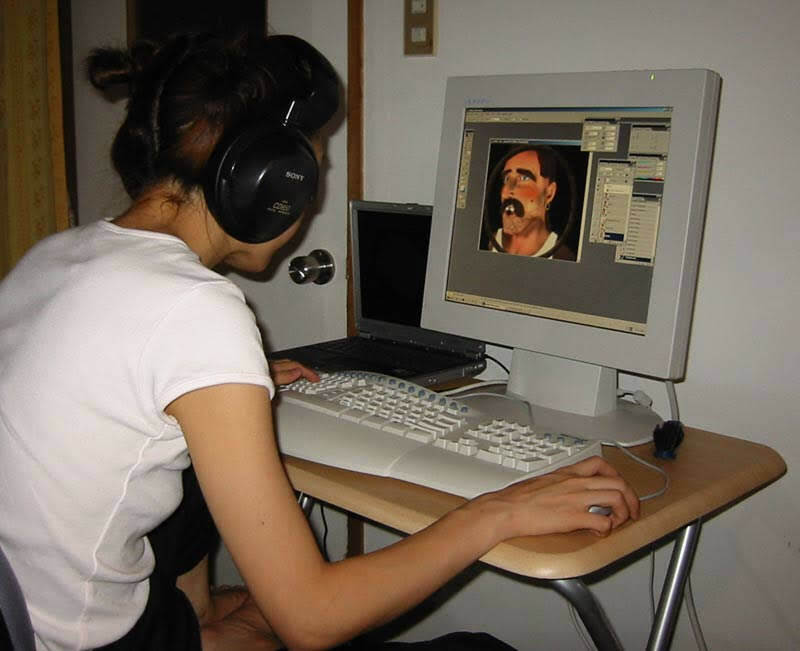 So that’s how it was being an indie dev in the early 2000s. Cya! This entry was posted in Development/RTsoft on September 11, 2018 by Seth. If you write a book, it lives forever. 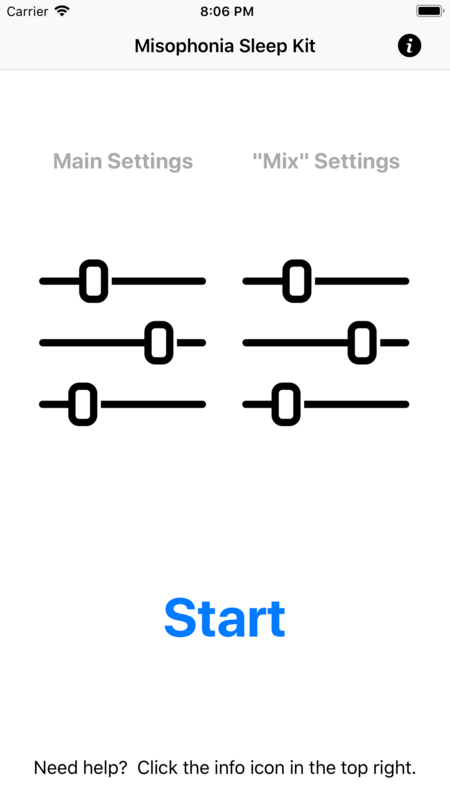 If you write an iPhone game, it exists until you stop updating it? It’s no longer purchasable because Apple removed it. The reason: “We noticed that your app has not been updated in a significant amount of time”. Being delisted is one thing, but another worry is platform death. Some of these can be emulated but newer platforms are increasingly relying on cloud services to do anything, backends that get shut down without ever being publicly documented. Good luck, emulator writers and software archivists, we’re counting on you. In some cases we developers can help out by releasing legal free versions (sans DRM of course) of old stuff that is no longer commercially relevant. To that end, I shall be making another old game of mine free tomorrow as well as open-sourcing it…! This entry was posted in Development/RTsoft on September 10, 2018 by Seth.